No sands of time can bury this classic. Let’s be honest. For many PC gamers, it’s hard to get too excited about a console port. 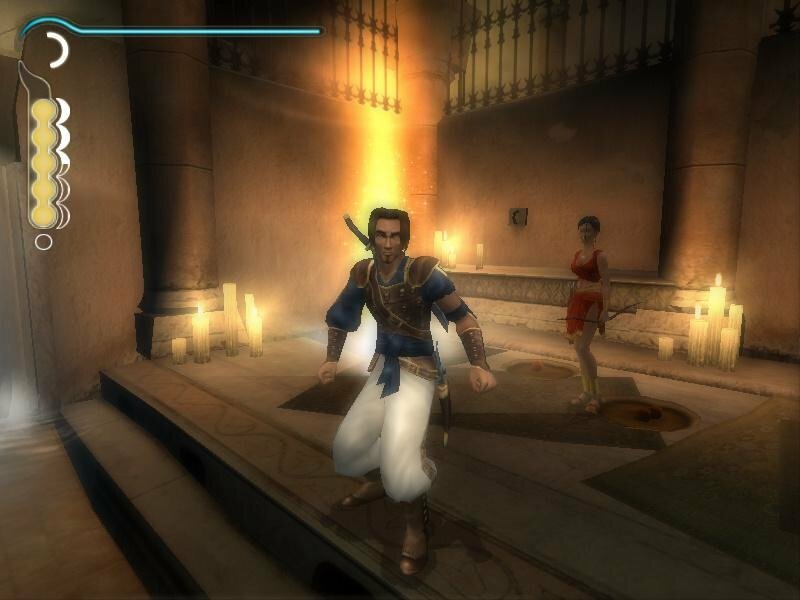 It’s even harder to have any interest in a sequel to a lackluster Tomb Raider clone ( remember Prince of Persia 3D? 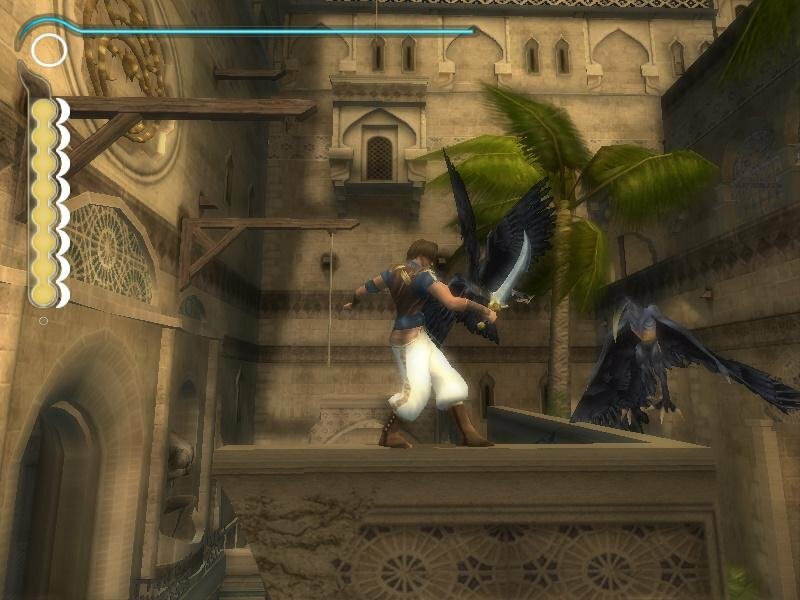 ), but Prince of Persia: The Sands of Time is both of these things. 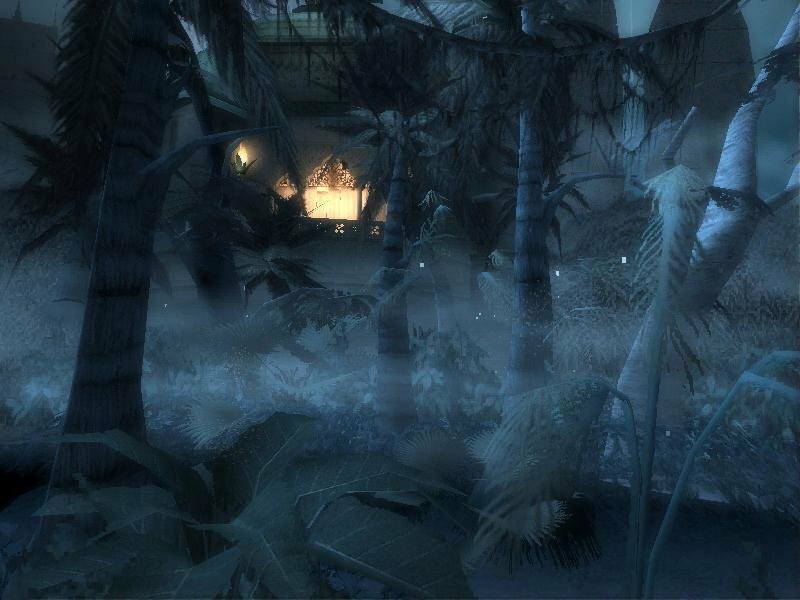 It’s also one of the best third-person adventure games you’re ever likely to play, and far from the usual average run-and-jump game of this sort. 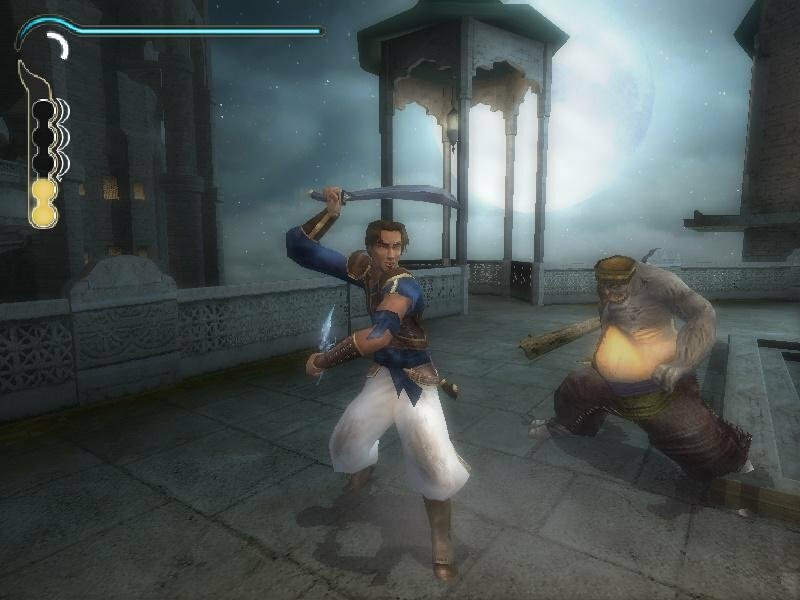 This revival of the long-running line of games transcends its genre and heritage to create what could be considered gaming art. That isn’t to say you haven’t played the Sands of Time before, as loyalty to Mechner’s original style has been paramount. 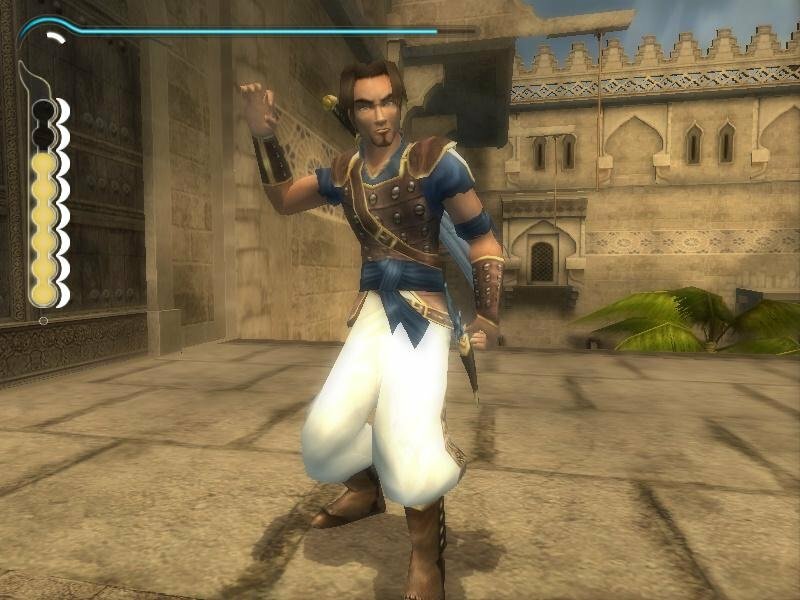 The prince can run, climb, jump, and hang off and shimmy across ledges as gracefully as he did in his 8-bit days, but has since also learned a bunch of other tricks courtesy of twenty intervening years of game and technology advancements. 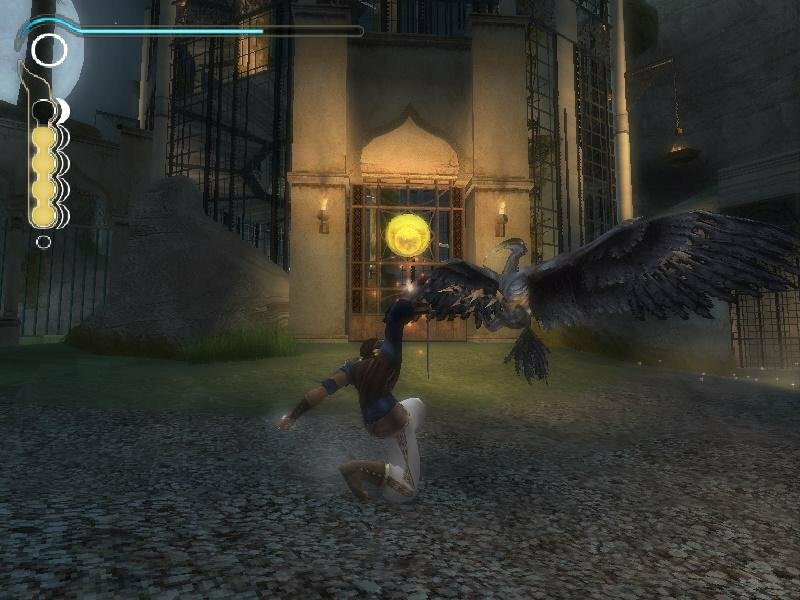 The beauty here, however, is in the sheer elegance in which all these elements are brought together, creating a package that is not just visually stunning, but enticing from a gameplay and storytelling perspective. Unlike past iterations of the princely tales, you aren’t strictly speaking here to save the princess. 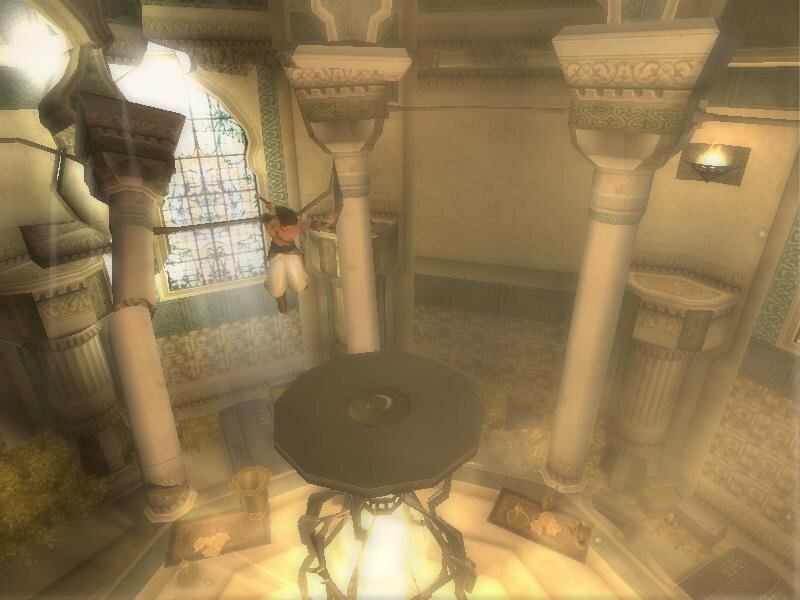 It seem that the prince’s father went on a raiding trip to India, based on treacherous information from his royal vizier, and found the Sands of Time housed in a huge, magical hourglass. Combined with a time-altering dagger, the Sands escape the hourglass and turn the royal castle into a barren, zombie-strewn wasteland. Only the prince and a mysterious Indian princess can make things right. This princess often fights and runs side-by-side with the prince, although you never control her directly. 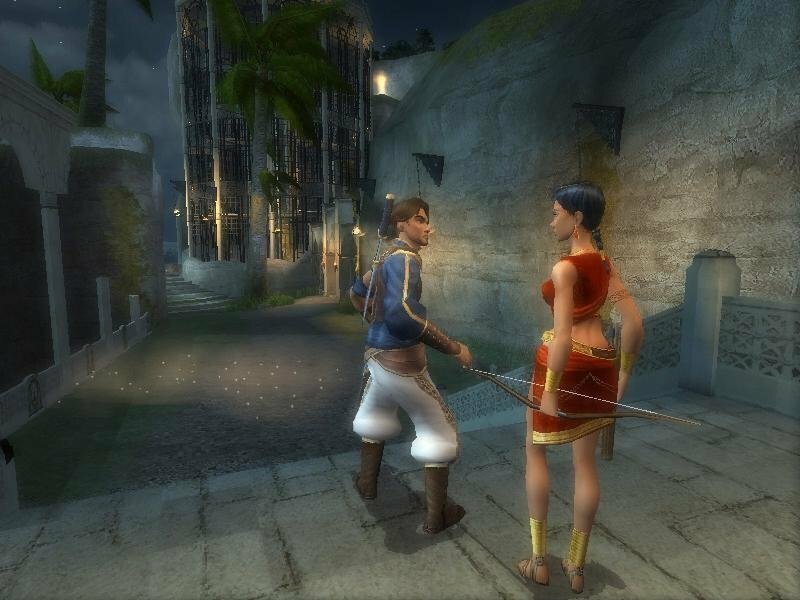 Her bow-handling skills come in handy, and some of the room obstacles require her to perform actions for a movie-like team-play feel. 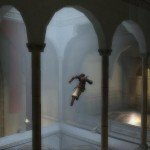 The prince himself is possibly the most agile and remarkably adept gaming superhero ever created. Sarcastic, guilty, and determined, he’s the quintessential lead. More than that, his physical abilities of gymnastics and swordplay are beyond stunning. 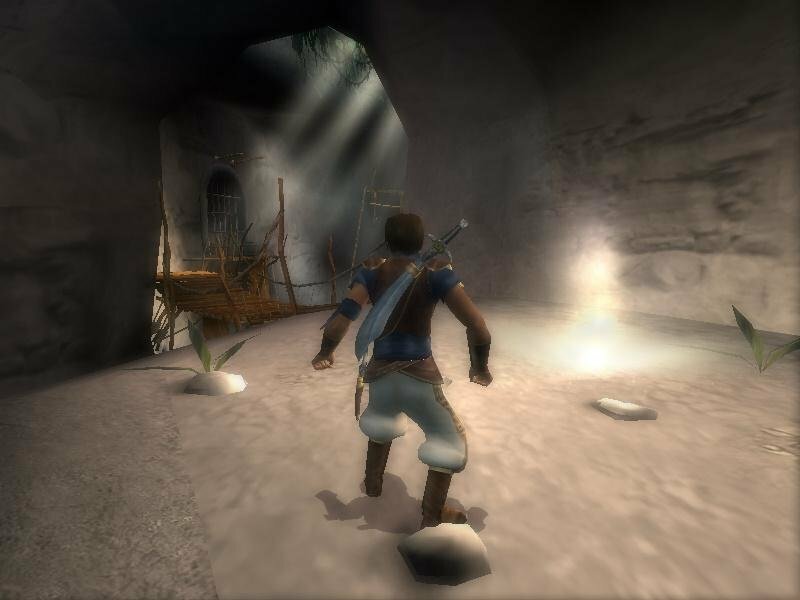 The side-scrolling entries in the series have always held the watermark for agility-based gameplay, but this latest iteration brings it to a new level. The prince’s ability and agility is dazzling and often awe-inspiring. 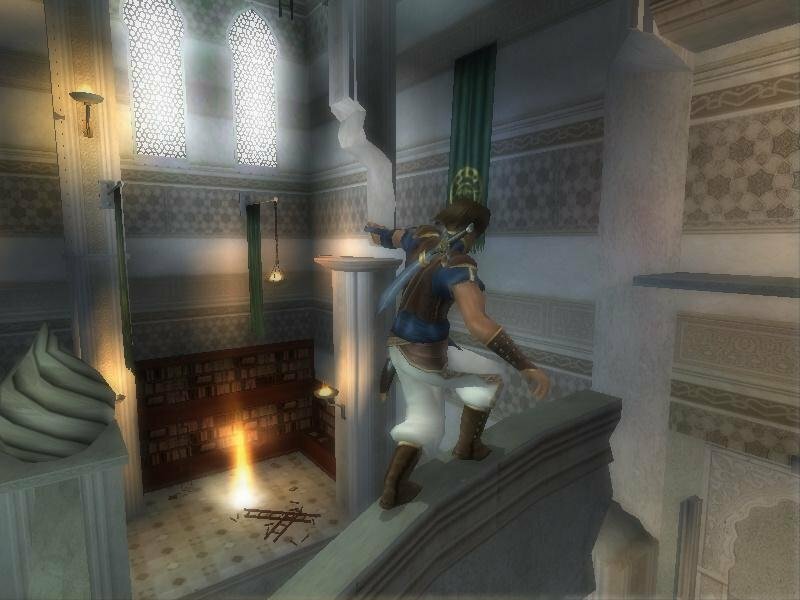 He can run along the sides of walls, run up walls, leap, flip, swing, and perform other equally acrobatic feats with amazingly realistic human grace, and it’s simply great fun to learn his moves to get that important edge in combat. 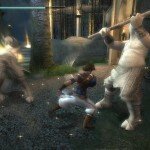 Equally as important is how the game uses its array of movement and animation. 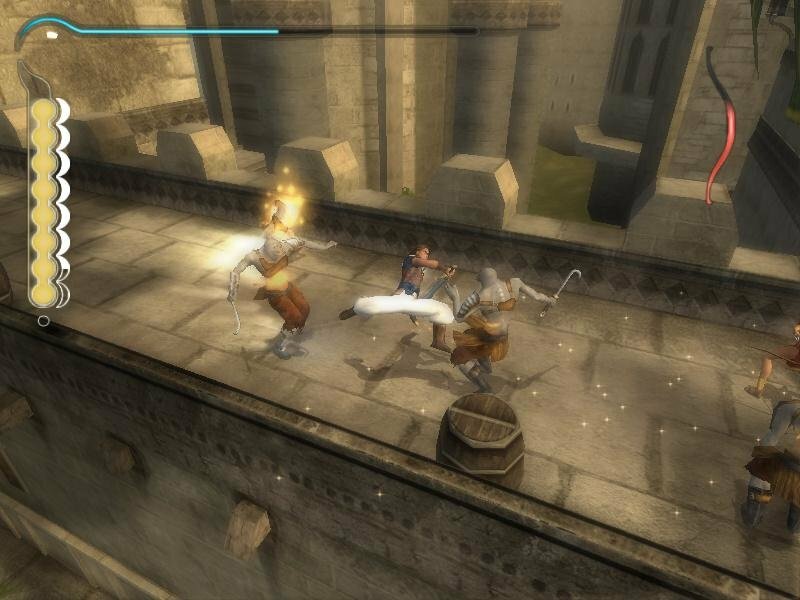 Save points, like the one behind the prince, are evenly distributed along the game world. 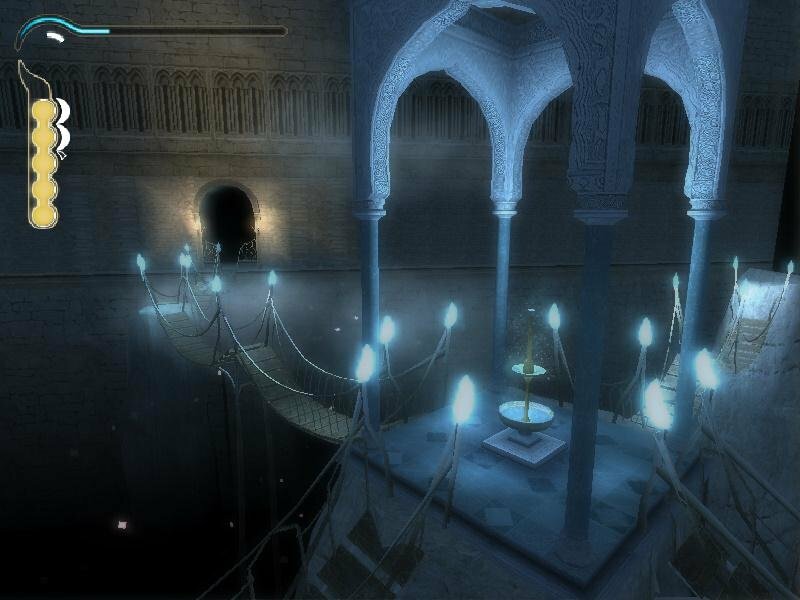 Taking a room-by-room approach, The Sands of Time could be the most visceral puzzle game ever. 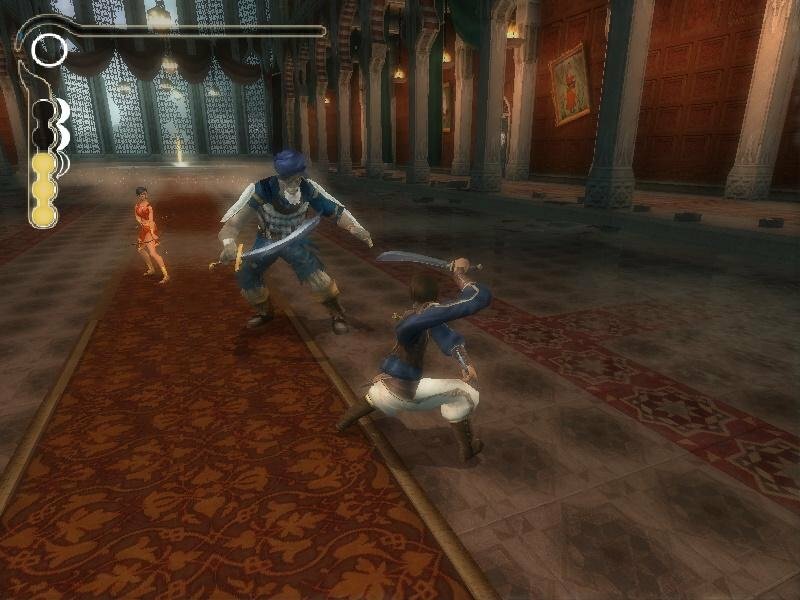 All those princely moves do is serve as a means to get you from point A to B, and figuring the right combination of moves to do so is the core of the gameplay. 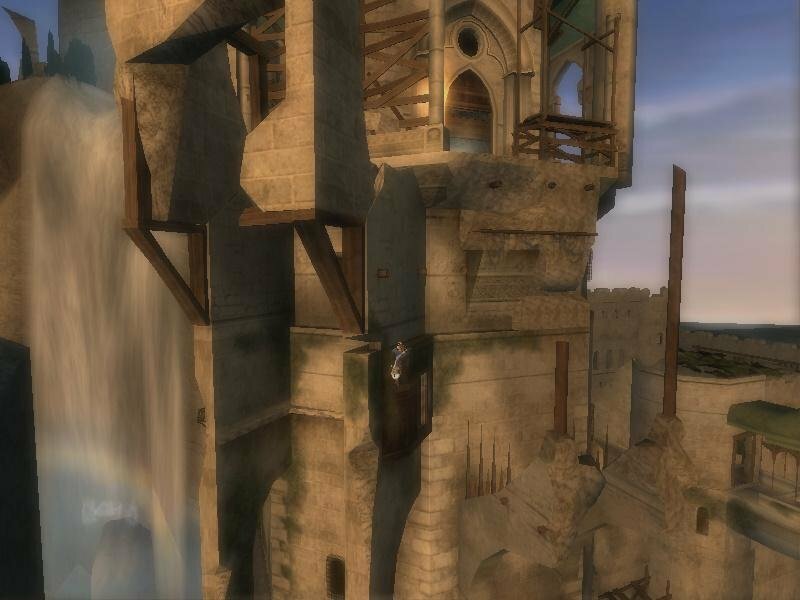 You know there’s something special when a puzzle solution involves running across a spinning, blade-strewn wall, leaping to a ledge, then using your leverage to jump back and forth up a wall, onto a column, then flip over a flag pole to a waiting tower ledge. 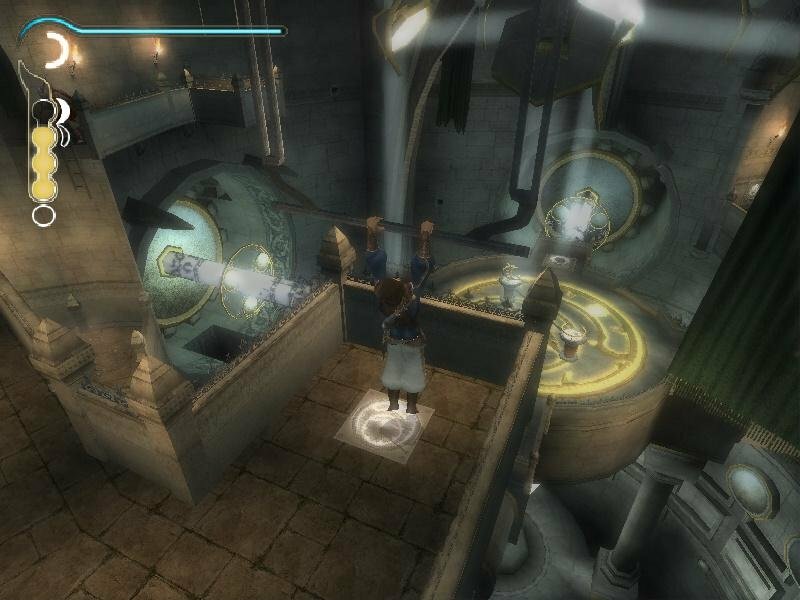 These puzzles get more complicated as the game progresses, but seldom do they feel like a chore. 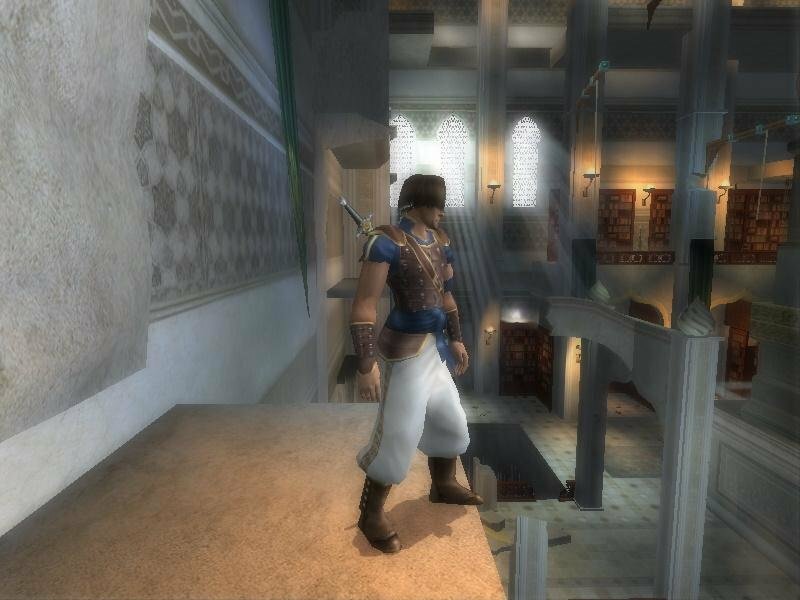 In fact the gymnastically inclined royal palace is central to Prince of Persia’s fun. 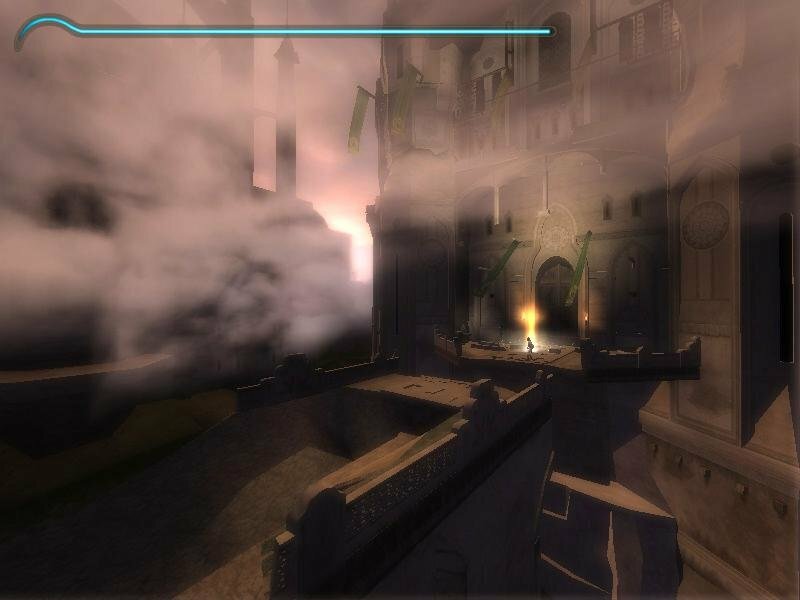 This is also what a console port should look like. All the video, sound and control configuration options have been flawlessly implemented, so you won’t have to close the game and run a separate setup program just to change the screen resolution. Although easily playable with a gamepad, I’ve gotten so good with a keyboard and mouse combo that I see no reason to switch. And while you get the odd camera quirk every now and then, overall it’s a fantastic system. 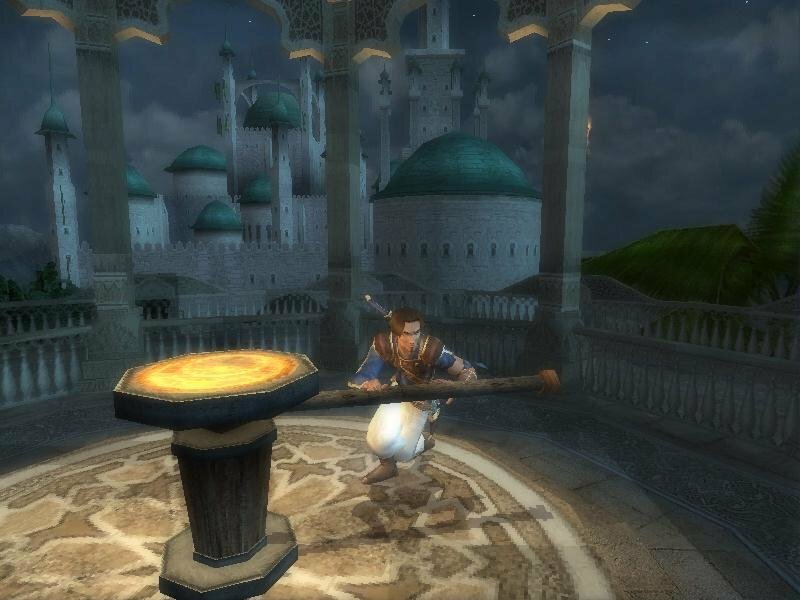 Despite its cross-platform design, the developers have managed to create a stunning piece of art for players to roam through. It’s a delicate balancing act when sand eagles are hovering above you. 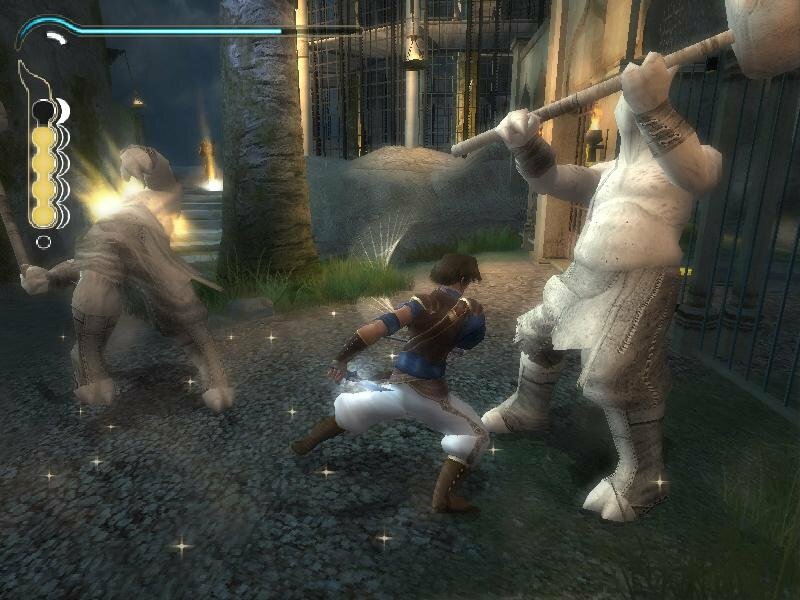 One of the Dagger’s powers include turning enemies into temporary sand sculptures. There’s no loading between levels in Prince of Persia and what little loading there is on startup is negligible, giving the impression that it truly is one continuous adventure. 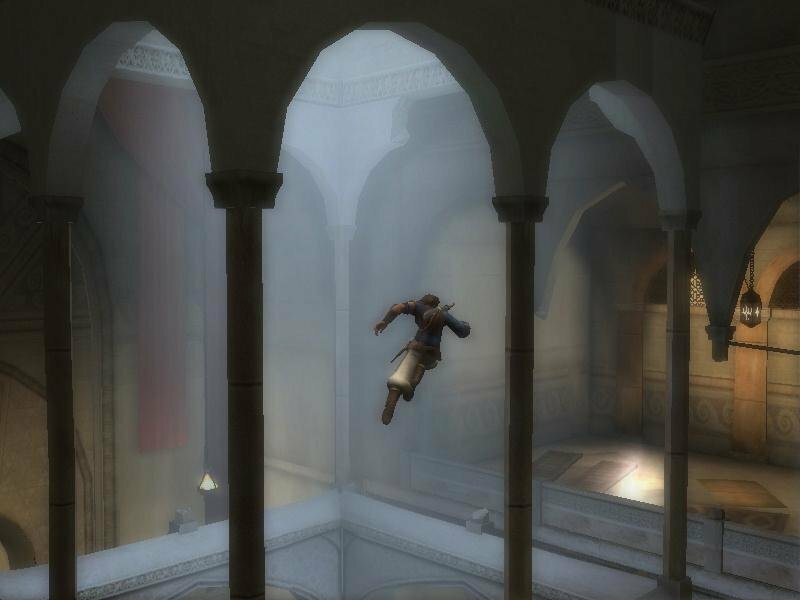 The mix of medieval Persian architecture, gloomy fog and lighting, and beautifully animated and expressive characters help make the gameplay shine. The evocative soundtrack, exceedingly well-done voice acting, and atmospheric sound effects lend an even deeper sense of involvement to the action. 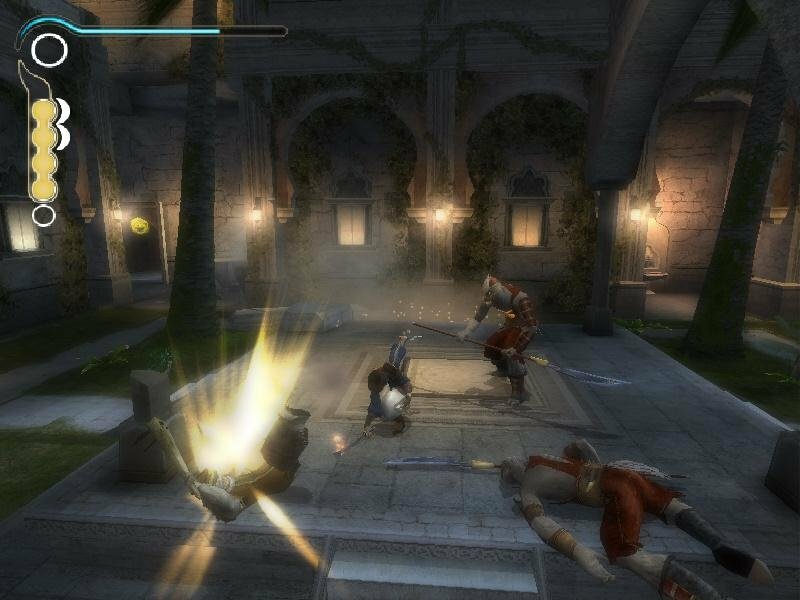 Console-haters might reject the use of save locations, but the game has them in virtually every room, and in fact make a lot of sense when used in tandem with the Dagger. 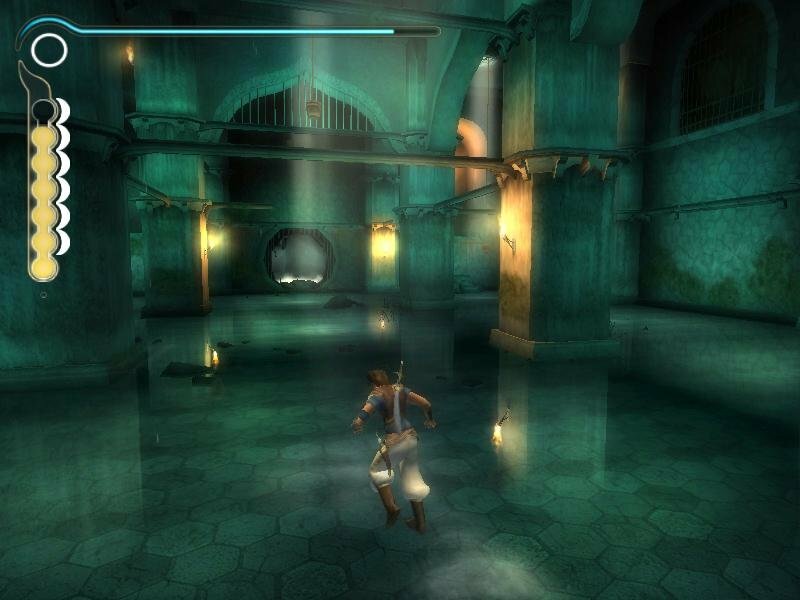 Even the sewer level in POP is awesome. It’s not just any dagger, mind you, but a time-controlling dagger. 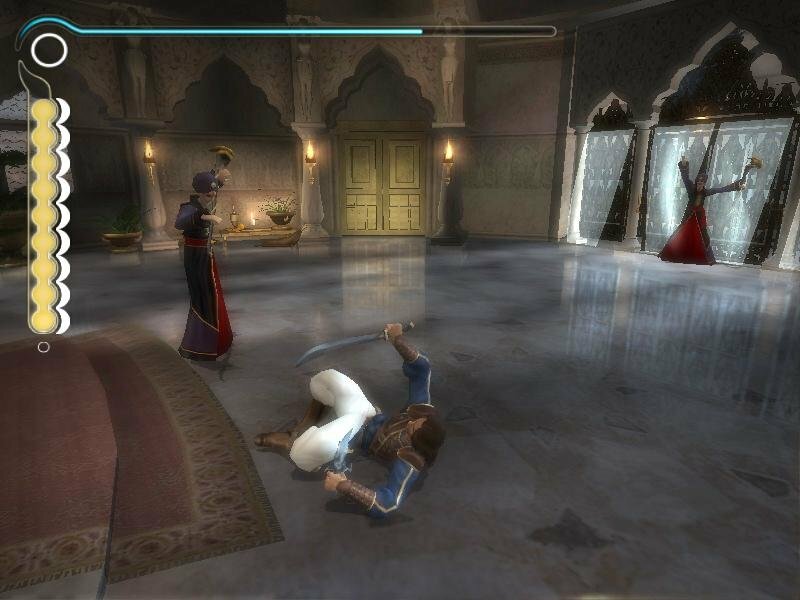 Send the game into slow motion for bullet-time sword battles, but more importantly, if you miss a jump, you can rewind to just before the prince’s untimely demise and try it again. You have a limited amount of sand to play with, however, so the time reversal, acceleration, slow motion, and freezing functions should be used sparingly. 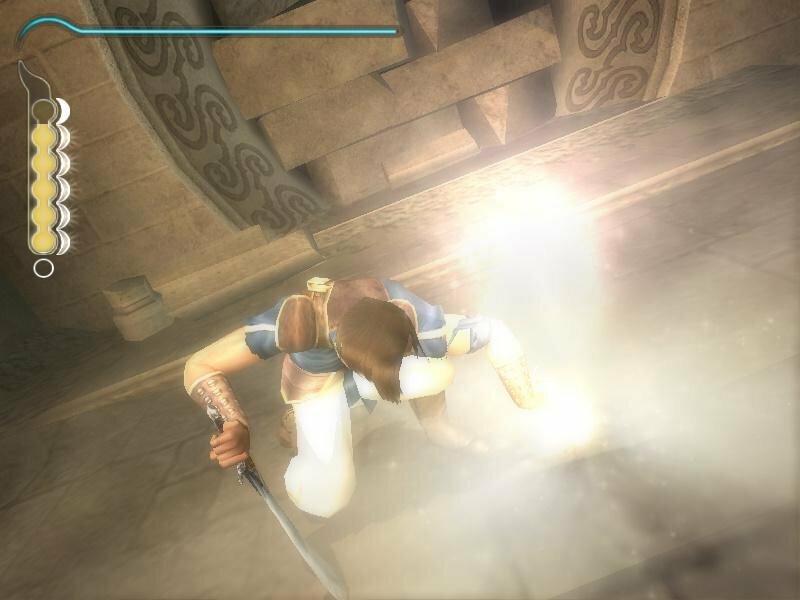 Refueling is done by sucking the sandy essence out of enemies, or finding magical sand piles for the dagger to absorb, and it’s all far from being a gimmick. It’s an integral, highly entertaining, part of the game. 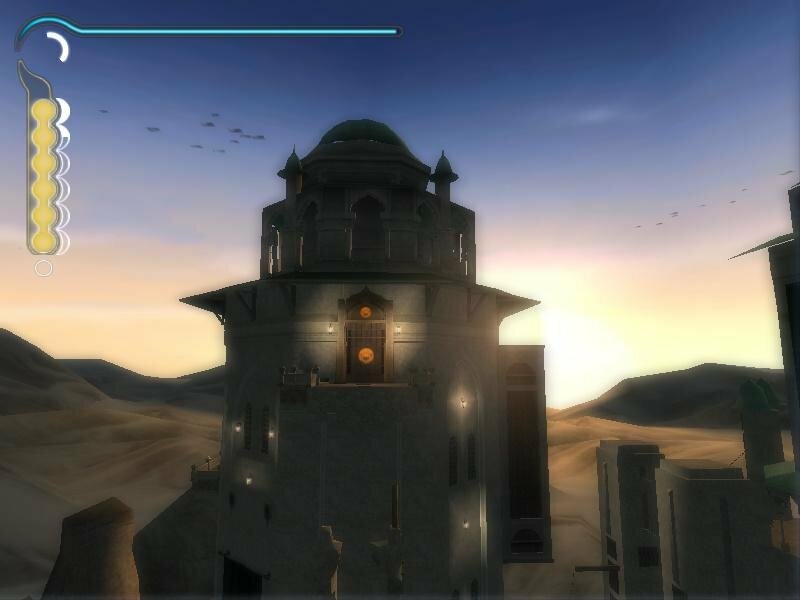 For anyone who likes third-person action and adventure, The Sands of Time is a must-have. It’s an incredibly beautiful and artistic game that manages to balance eye-candy and gameplay gimmickry with truly solid game design, all paced with perfection. While console ports are generally scoffed at, this one is a absolute classic on any platform. Can someone pease tell me how to install this game so it will work ? Dude, you literally have to extract it the rar file. It can’t be any easier. 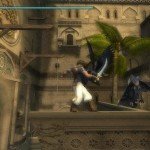 Old PC Gaming could you,please, add Assassin’s Creed to your site? I’ve searched for it but i couldn’t find a working version or one compatible with my PC(i have Windows 7 64-bit ). Please,try to add it to your site because i don’t find it anywhere.